Sustainability is one of the major trends in the 21st century. With goals developed by the UN there is also a clear roadmap at hand. However, current figures from Eurostat show that even the environment‘s model student Europe is struggling to achieve sustainable development. Although the circular economy is promoted by policymakers and business alike, there is still very little happening. A recent study identifies a variety of regulatory barriers that keeps the economy linear. And there doesn‘t seem to be much hope of these barriers changing anytime soon. The mammoth population on earth is responsible for creating a great deal of waste annually. With the advent of technology, the volume of electronic waste, or e-waste, has also risen considerably in the last two decades. E-waste is contributing to a rapid and ever-growing waste stream across the world, owing to the shrinking life span of electronic devices. In order to process the increasing volumes of solid waste in the city, the Nagpur Municipal Corporation (NMC) is now hoping to get European Union countries to help manage the issue. During the14th International Aluminium Recycling Congress, RECYCLING magazine talked to European Aluminium’s Director General, Gerd Götz, and Recycling Director Magdalena Garczynska about the state of the industry, the importance of recycling rates and the upcoming challenges. 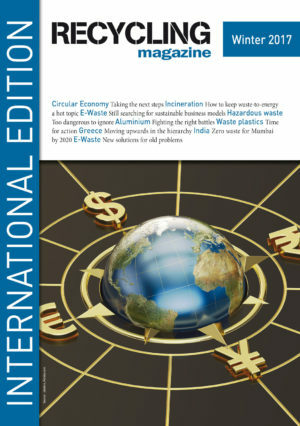 With the communication on waste-to-energy, which was published at the end of January, the European Commission tried to explain its point of view on this topic. Obviously, this was met with approval as well as with rejection. A group of environmental organisations warns of false hopes in bioplastics. The organisations remind us that the main focus has to be on reducing the overall use of plastics. In terms of waste management, Greece is not among Europe‘s frontrunners. However, in some parts of the country the standards are at European level. That certainly applies to the Prefecture of Thessaloniki, where the public company Fodsa is responsible for waste management and recycling. At a time when Mumbai, India‘s financial capital, is facing the pressure of increasing population, there is also one more challenge the city needs to cope with: the management of solid waste generated in the city. Mumbai generates close to 8,500 metric tonnes of solid waste in the city, of which 3,000 tonnes per day are processed and the balance is dumped at one of two dumping grounds in and around the city, at Mulund and Deonar. To find out how, the Corporation is coping up with this challenge and what new projects the Municipal Corporation of Greater Mumbai (MCGM) is working on to make Mumbai a zero- waste city, Jagdish Kumar spoke to Additional Municipal Commissioner (Projects) Dr. Sanjay Mukherjee. A part of the International Electronics Recycling Congress is always dedicated to technical innovations. This year’s show saw a new concept for refrigerator treatment, shock therapy for WEEE and pyrolysis in e-waste recycling. Is the current business model for WEEE still up-to-date? This was the main topic of an expert discussion on the future of e-waste recycling at the International Electronics Recycling Congress in Salzburg. First Vice-President Frans Timmermans has resumed the European Commission’s first action plan on the circular economy with a great deal of self-praise. He also launched a number of initiatives and presented an outlook for 2017. The Ellen MacArthur Foundation again took the opportunity to launch a new paper during the World Economic Forum in Davos. After last year’s publication laid the foundation, this year’s paper announces action to tackle the world’s waste plastics packaging problem. Although hazardous waste only accounts for approximately four per cent of all waste generated, it plays an important part in European waste management due to its dangerous nature. According to a report published by the European Environment Agency, the amount of hazardous waste is generally increasing. On the other hand, the member states could do more to prevent this kind of waste.